Every child has the right to grow up in a safe environment, to lead a healthy life and develop positive future prospects. A healthy environment is a precondition for children’s physical and mental health. Without it they cannot grow up and become healthy members of society. Children get sick through exposure to toxins when performing mining or agricultural labour. The exhaustion of natural resources forces people to migrate to big cities. Injustices related to land rights and access to water cause the destruction of entire ecosystems and the loss of cultural identity. Terre des Hommes has shone a light on how a healthy environment is essential to a child’s physical and mental health by organising the Global Action Month. Across the world, over 140,000 people took part in 128 events to show how children in all corners of the globe lack access to drinking water and food, and suffer from ill-health due to environmental degradation. These obstacles seriously hinder children’s ability to realise their true potential. “I need clean air to breathe and I need clean water to drink and I also need healthy food to eat. Lead permanently stays in my body and I can’t wash it away in the shower.” C. Mulenga, Zambia, Speech at the UN Committee on the Rights of the Child’s General Day of Discussions, 2016. 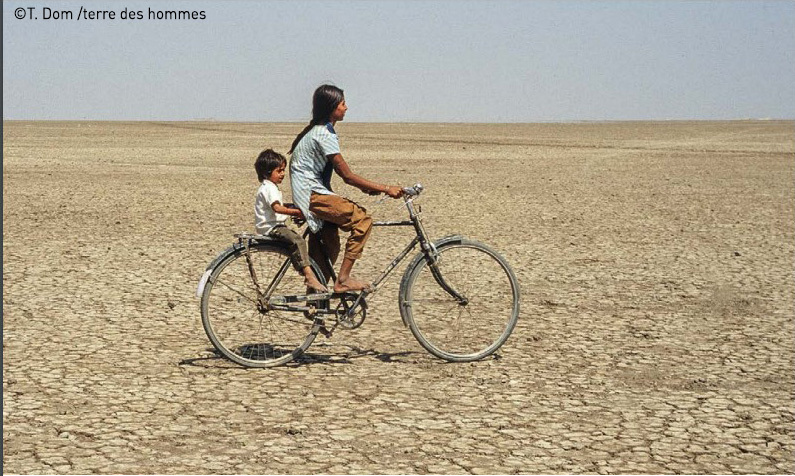 Terre des Hommes has also championed the link between a healthy environment and a rewarding childhood by taking the lead in organising the 2016 UN Committee on the Rights of the Child’s General Day of Discussions focusing the debate on the link between flourishing environments and flourishing children. While we deem children to be particularly vulnerable to environmental harm, we also believe that children are powerful actors to achieve sustainable change. Uncovering the link between child labour and environmental degradation. Our latest child labour report, “The Neglected Link: Effects of Climate Change and Environmental Degradation on Child Labour,” explores how environmental damage also has an impact on whether children are pushed to work. It also exposes how the kind of work children engage in, the conditions of work, the exposure to dangerous toxins and the risk of exploitation is increased when a child’s environment is degraded.